Richard Clouston interviewed Nitzer Ebb frontman and founding member Douglas McCarthy for Fact Magazine. He talks about the group’s early post-punk years, touring with Depeche Mode, acid house anthems and the new album, working title ICP. There you will also find a special free download: a selection of classic Ebb remixes chosen by Douglas! 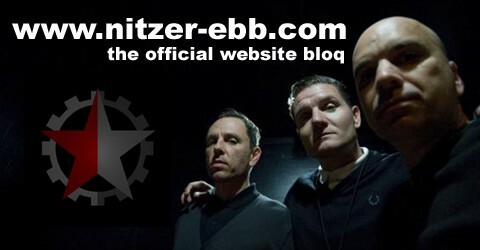 Nitzer Ebb will be headlining the Madame Sata Fest in Sao Paulo / Brazil on August 15th, 2009. Jason Payne and Bon Harris if Nitzer Ebb turned classic video game themes into electronica lounge songs. Opening the night was a performance from Nitzer Ebb members Bon Harris and Jason Payne. With Harris in a sweater vest, Payne in a propeller beanie and both in taped-up, thick frame glasses, the EBM stalwarts played a set of reconstructed video game music. Samples from Donkey Kong and other beloved games were twisted into beat-heavy jams fit for a night at the industrial club as the duo moved in a stiff, robotic fashion that resembled the Tri-Lambs homecoming prize winning routine.